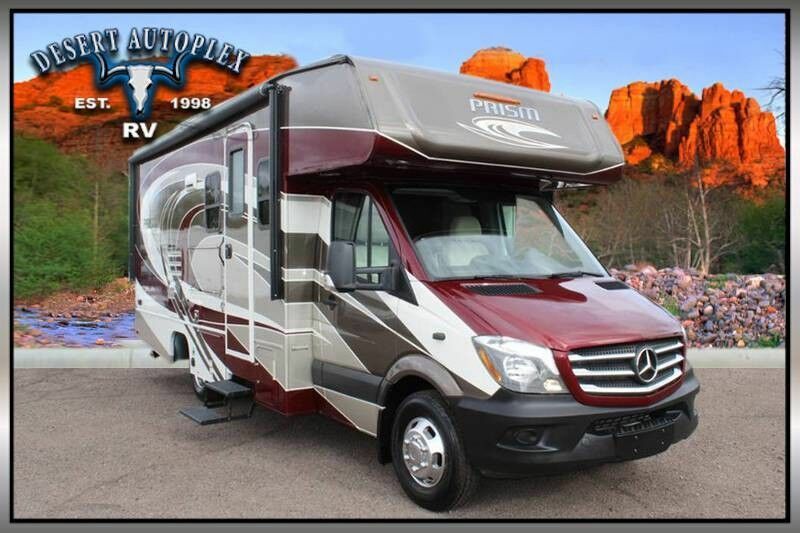 This elegant class C motorhome is sure to impress anyone, please review the information provided and call our professional sales team toll free at 1.888.385.1122 today! 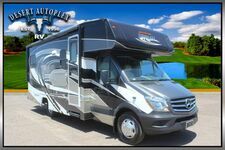 26-Gallon Fuel Tank, Driver & Passenger Air Bags, Deluxe Chassis Package, Cruise Control, Tilt Steering Wheel, Roto Cast Rear Trunk Box/Metal Side Boxes, Dash Air Conditioning, 3,500 lb. Towing Hitch w/7-Way Plug, 2" Steel Vacuum Bonded Floor, 2" Aluminum Vacuum Bonded Sidewalls with Lamilux 4000 Color Infused Fiberglass, Crowned, Laminated TPO Roof, Power Double Entrance Step, Steel Entry Step box, Rubber Entry Step Treads, Dead Bolt Lock Entrance Door, Carmel 80" Radius Entrance Door w/ Built-in Strut, Black Arm Power Patio Awning, Black Slide Out Awnings, Power Windows & Locks, Spare Tire, Stainless Steel Wheel Inserts, Carmel High Gloss Sidewalls & Rearwall, Rear Steel Tube Bumper, Smooth Exterior Range Vent, Exterior TV Ready Area, Underhood DEF Tank, Vinyl Graphics, Carmel Thumb Lock Trunk Doors, All Aluminum Walls, Aluminum Bunk Floor, Low Roof Chassis Cab, Black Rear Ladder, Exterior LED Marker Lights, Incandescent Tail Lights, Hellwig Swaybar, and more! Passenger & Driver Swivel Seats, Jack Wing TV Antenna, LP Leak Alarm, Smoke Detector, Carbon Monoxide Detector, Fire Extinguisher, Touch Screen Radio & Backup Monitor w/Dash Speakers, Color Backup Camera, Power Sliding/Rotating 12V 32" TV/Stereo/Soundbar/Pantry, Serenity Ash Cabinet Doors, Black Hardware (3-3/4" Spread), Vinyl Padded Up & Angle Pads, HPL Countertops Throughout, Roller Bearing Drawer Guides Throughout, Poplar Drawers, Irvine Roller Shades & Ascot Valances, Tinted Radius Slider Windows, Rotate/Recline Pilot & Passenger Seats, U-Dinette, Single Child Tether at Forward Facing Dinette, Hardwood Doors - Raised Panel Uppers/Flat Panel Lowers, Hardwood Slab Drawer Fronts, Glass Insert Doors in Select Areas, Shaker Diplomat 3P House Type Bath Door, Black Recepts/Rotaires/Switches, Interior Safety Grab Handle by Entrance Door, and more! Residential Size Microwave Oven, Dometic Flush Mount, Double Door Refrigerator, Paneling Refer Inserts, Monitor Panel Command Center, Composite Undermount Double Bowl Kitchen Sink w/Lid, Black Power, Lighted Range Hood, Black Attwood 3-Burner Cooktop w/ Oven, Flip-up Countertop Extension, FL Standard Satin Nickel Kitchen Faucet, Kitchen Tile Wall Border, Springfield HD Silver Table Base, and more! Water Panel w/City/Tank/Winterize/Waste Tank Flush, Low Point Drain & Winterize Valve at Fresh Tank, Exterior Shower, Power Bath Vent, Demand Water Pump, Lavatory Sink - Parchment, Parchment Lavatory Faucet w/Round Knobs, Parchment Shower Head & Faucet, Medicine Cabinet, Skylight Over Shower, Satin Nickel Shower Door, One-Piece ABS Shower Surround - Parchment, Black Robe/Towel Hooks, 6-Gallon Gas E.I. Water Heater, Composite Foot Flush Toilet - Parchment, and more! Queen Bed 60" x 74" Flip Over (Ticking Covered), Bedspread, Privacy Drape - Lower Cab, Privacy Drape & Track Cover, Bedroom Slider Door, Cab Over Bunk 48" x 90" (Fabric Covered), Child Safety Ladderw/Bunk Velcro Restraints, Child Restraint Net System, Bedroom Window, and more! 30 Amp Power Cord, 55 Amp Electronic Converter, Auxiliary Battery, GFI Circuit, Manual Battery Disconnect, Outside 120V Receptacle (DS), Awning LED Strip Light, Wall Mounted Thermostat, Outside Cable TV Hookup, 18,000 BTU Ducted Furnace, 13,500 BTU Ducted Roof A/C, Onan 3.6KW LP Generator, Automatic Generator Changeover, Exterior Solar Plug-in Connection, LED Lights Throughout, Pop-Up Kitchen Recept, Bed Area 110V CPAP Ready Area & 12V/USB Charging Station, and more! 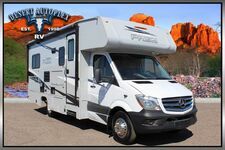 This 2018 Coachmen Prism 2200 Single Slide Class C Motorhome is absolutely stunning! Financing is always available on approved credit, and we will even walk you through your new purchase upon delivery to show you how everything works if you're not familiar already! Call our professional sales team toll free at 1.888.385.1122 with your best offer, HURRY before it's too late!! !